The mammalian transient receptor potential (TRP) superfamily of cation channels can be divided into six major families. Among them, the “classical” or “canonical” TRPC family is most closely related to Drosophila TRP, the founding member of the superfamily. All seven channels of this family designated TRPC1-7 share the common property of activation through phospholipase C (PLC)-coupled receptors, but their gating by receptor- or store-operated mechanisms is still controversial. The TRPC3, 6, and 7 channels are 75% identical and are also gated by direct exposure to diacylglycerols (DAG). TRPC3, 6, and 7 interact physically and, upon coexpression, coassemble to form functional tetrameric channels. This review will focus on the TRPC3/6/7 subfamily and describe their functional properties and regulation as homomers obtained from overexpression studies in cell lines. It will also summarize their heteromultimerization potential in vitro and in vivo and will present preliminary data concerning their physiological functions analyzed in isolated tissues with downregulated channel activity and gene-deficient mouse models. The family of classical or canonical TRP cation channels (TRPC) is composed of proteins that are highly related to Drosophila TRP, the founding member of the TRP superfamily involved in the photoreceptor signal transduction pathway (see Clapham 2003 for a recent review). Its seven family members can be subdivided into subfamilies on the basis of their amino acid homology. While TRPC1 and TRPC2 are almost unique, TRPC4 and TRPC5 share a ∼65% identity. TRPC3, 6 and 7 form a structural and functional subfamily sharing 70–80% identity at the amino acid level and their common sensitivity towards diacylglycerol (DAG; Fig. 1b; Hofmann et al. 1999; Okada et al. 1999). a Structural elements of the TRPC6 cation channel. The TRP domain contains an EWKFAR motif conserved in all TRPC, TRPV, and TRPM family members. 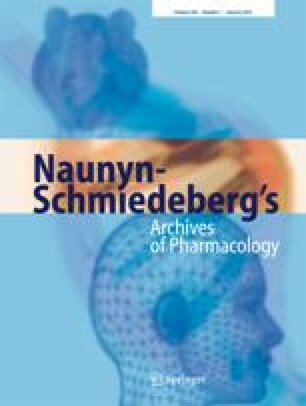 See Niemeyer 2005 for a definition and functional role of ankyrin repeats in TRPV channels. The role of the calmodulin-IP3 receptor-binding domain (CIRB domain) is discussed in the text. b Phylogenetic tree and heteromultimerization potential of the TRPC family. Lines on the left represent the phylogenetic relationship and boxes on the right indicate the heteromultimerization potential of the TRPC subfamily: every member is able to multimerize with itself and with members of the same subfamily (TRPC1, TRPC2, TRPC3/6/7 (dotted line) and TRPC4/5(dotted line)). TRPC1 is able to form heteromultimers with TRPC4 and TRPC5 (broken line) (Hofmann et al. 2002; Goel et al. 2002) and serves as an adaptor protein for the heteromultimerization between the TRPC4/5 and the TRPC3/6/7 subfamilies (unbroken line; Strübing et al. 2003). Members of the TRPC3/6/7 subfamily display common structural features of the TRPC family: they contain four N-terminal ankyrin repeats, six transmembrane-spanning domains and a putative pore region located between transmembrane domains 5 and 6 (see Fig. 1a). Evidence for the importance of the highly conserved pore region for TRPC function is derived from site-directed mutagenesis studies resulting not only in the complete loss of channel activity upon heterologous expression, but also in a dominant-negative effect of a mutated channel monomer on functional homo- or heteromeric channel tetramers (Hofmann et al. 2002). However in contrast to e.g., TRPV channels (van Abel et al. 2005), the exact location of a selectivity filter and the pore helix has not yet been determined in TRPC channels. In all eukaryotic cells, activation of phospholipase C (PLC)-coupled membrane receptors by hormones leads to an increase in the intracellular Ca2+ concentration [Ca2+]i. Both activation of PLCβ-isozymes by G protein coupled receptors and of PLCγ isoforms by receptor tyrosine kinases results in the hydrolysis of phosphatidylinositol 4,5-bisphosphate to generate inositol 1,4,5-trisphosphate (IP3) and diacylglycerol (DAG). The increase of the intracellular calcium concentration ([Ca2+]) is initially caused by the release of Ca2+ from IP3-sensitive intracellular stores and is followed by an influx of cations from the extracellular space through activated TRP and other yet unknown channels. Two mechanisms by which PLC-linked receptors activate Ca2+ entry across the plasma membrane have been extensively discussed lately: store-operated Ca2+ entry (SOC) and receptor-operated Ca2+ entry (ROC). SOC occurs when inositol 1,4,5-trisphosphate (IP3) or some other signal discharges Ca2+ from intracellular stores in the endoplasmic reticulum (ER) and the subsequent fall in the ER Ca2+ concentration then signals to the plasma membrane activating store-operated channels. Experimentally, a similar cellular effect is evoked by thapsigargin which blocks sarcoplasmic/endoplasmic reticulum Ca2+ (SERCA)-pumps and results in leakage of calcium ions from internal stores. Neither the exact mechanisms for this signaling pathway, nor the molecular identity of the SOC channels are known with certainty so far. However, there are at least three general theories for the mechanisms of signaling. One theory suggests the release from the ER of a diffusible messenger of still unknown identity, called calcium influx factor (CIF), which would activate SOCs. It has recently been postulated that CIF does not directly activate SOC but releases intracellular phospholipase A2 (iPLA2) from constitutive inhibition by calmodulin. Lysophospholipids as reaction products of iPLA2 activity are subsequently thought to be able to induce SOC currents in isolated inside–out patches (Smani et al. 2004). The second theory, known as conformational coupling (Irvine 1992; Berridge 1997), involves agonist-bound IP3 receptors located in close vicinity to the plasma membrane thus directly activating membranous Ca2+-permeable ion channels. In a third mechanism, a Ca2+ entry channel transported in a cytoplasmic vesicle is proposed to fuse with the plasma membrane to mediate SOC (Yao et al. 1999; Patterson et al. 1999). In accord with this notion, recent data suggest that TRPC channels are held in reserve and are rapidly translocated to the cell membrane in response to a stimulus (Cayouette et al. 2004; Bezzerides et al. 2004). At present, the gating mechanism(s) of TRPC channels and especially of the DAG-sensitive TRPC3/6/7 subfamily still remain(s) elusive, and it is a highly contentious issue as to whether TRPC channels are involved in SOC entry at all. Along these lines a recent report by Singh et al. demonstrated that receptor-dependent activation of TRPC3 is associated with exocytosis-mediated plasma membrane insertion while thapsigargin had no effect on subcellular localization of TRPC3 (Singh et al. 2004). ROC channels are gated in response to agonist binding to a PLC-coupled cell membrane receptor distinct from the channel protein itself. This contrasts with ligand-gated ion channels which are activated by ligand binding directly to the channel subunits. Over the past few years, members of the TRPC family of cation channels have emerged as likely molecular candidates for ROC channels. TRPC3, TRPC6 and TRPC7 are non-selective cation channels which display double rectification (summarized in Fig. 2 and Table 1). However, the functional characterization of members of the TRPC family following heterologous overexpression of their cDNAs in various different cultured cell lines gave rise to contradictory results regarding intrinsic channel properties, such as activation mechanisms as well as ion selectivity. Another drawback in the analysis of TRPC channels is the lack of specific pharmacological tools. TRPC channels are blocked by La3+ and Gd3+ ions (Trebak et al. 2002), and most intriguingly, IC50 values for Gd3+ ions differ between heterologously expressed channel homomers and endogenously occurring TRPC heteromers (Trebak et al. 2002; Vazquez et al. 2003). Due to the lack of discriminating channel blockers, it is not possible to define the physiological relevance of TRPC homo- or heteromers for complex organ functions in the whole organism. To overcome these limitations, targeted gene inactivation in embryonic stem cells and subsequent production of gene-deficient mouse models for each of the channels and channel subfamilies is necessary to analyze TRPC channel function in vivo. Current–voltage relationship of TRPC3, TRPC6, and TRPC7 as revealed by electrophysiological recordings of HEK293 cells heterologously expressing these non-selective cation channels. Note the high basal currents of TRPC3 and TRPC7 in contrast to the tightly receptor-operated TRPC6 channel (TRPC3 and TRPC6: from Dietrich et al. 2003b; TRPC7: Mederos y Schnitzler M, Storch U, Gudermann T; unpublished results). This review will focus on the TRPC3/6/7 family and describe their functional properties and regulation as homomers obtained from overexpression studies in cell lines. It will also summarize their heteromultimerization potential in vitro and in vivo and will present preliminary data concerning their physiological functions analyzed in isolated tissues with down-regulated channel activity and in gene-deficient mouse models. TRPC3 was the second cloned gene of the TRPC family (Zhu et al. 1996), and its biophysical properties are summarized in Table 1. A representative I–V curve is shown in Fig. 2 documenting double rectification. However, as for most of the TRPCs defined biophysical properties in their native environment are not available yet. Initially, TRPC3 was overexpressed in human embryonic kidney cells (HEK293 cells) and functionally characterized as a receptor-operated as well as a thapsigargin-activated cation channel (Zhu et al. 1996). Heterologous expression in Chinese hamster ovary (CHO-K1) cells, however, resulted in Ca2+-activated TRPC3 channel activity (Zitt et al. 1997). The latter results were confirmed by expressing a heart-specific splice variant of rat TRPC3 in Xenopus oocytes (Ohki et al. 2000). Subsequently, the activation of TRPC3 was carefully re-examined in a HEK293 cell line stably expressing high levels of TRPC3 (Zhu et al. 1998). In these cells, TRPC3 expression resulted in constitutive cation entry that was absent in untransfected cells. When constitutive TRPC3 activity was subtracted from Ca2+ entry induced by thapsigargin or carbachol, the authors concluded that TRPC3 is an agonist-operated cation channel but it is apparently not activated by store depletion. Applying single-cell fluorometry, the authors also discriminated Ca2+ entry through endogenous cation channels which were blocked by 10 μM gadolinium (Gd3+), from apparently Gd3+-insensitive cation entry through recombinant TRPC3 channels (Zhu et al. 1998). This finding, however, has to be interpreted with caution, because measurements of cellular Ca2+ signals are a rather indirect measure of channel function. Electrophysiological whole-cell recordings on TRPC3-expressing HEK 293 cells however reveal a Gd3+ block IC50 value of 2.5 μM (Mederos y Schnitzler M, Storch U, Gudermann T; unpublished results) similar to results obtained with the heterologously expressed TRPC6 ion channel (Inoue et al. 2001). Moreover, in DT40 chicken B lymphocytes, TRPC3 expressed at low levels was found to be activated by depletion of Ca2+ stores, while at higher channel densities in the cell membrane TRPC3 activity was increased by receptor coupling to phospholipase C isoforms (Vasquez et al. 2001, 2003). These results support the hypothesis that the cellular expression level of the channel protein may critically influence its functional characteristics (reviewed in Putney 2004). In contrast to the results mentioned above, electrophysiological analysis of a HEK293 cell line stably expressing TRPC3 provided evidence for a store-operated activation mechanism via conformational coupling. In excised membrane patches, TRPC3 currents previously elicited by store depletion were abolished after extensive washing and could be recovered by addition of brain microsomal membranes containing agonist-bound IP3 receptors (Kiselyov et al. 1998). This first piece of direct evidence for TRPC channel activation by IP3 receptors was subsequently complemented by the identification of contact sites in both proteins (Boulay et al. 1999) and corresponding peptides mimicking these contact sites were able to suppress or activate calcium influx through heterologously expressed TRPC channels as observed in calcium imaging experiments (Boulay et al. 1999). Moreover, by competitive binding of Ca2+/calmodulin and IP3 receptors to the same site (calmodulin-IP3 receptor-binding domain (CIRB domain)) in the intracellular C-terminus in all members of the TRPC family, a putative Ca2+/calmodulin-dependent inactivation mechanism of these cation channels was proposed (Tang et al. 2001). In agreement with this notion application of the calmodulin inhibitor calmidazolium resulted in enhanced TRPC3 channel activity (Zhang et al. 2001). However, these mechanisms of activation and deactivation have been challenged, because in a DT 40 cell line devoid of all three forms of IP3 receptors, TRPC3 is activated by agonists to the same extent as in wild type cells (Venkatachalam et al. 2001). Notably, in the same TRPC3-expressing HEK293 cell line previously used to develop the conformational coupling hypothesis, TRPC3 activation was recently demonstrated to function independently of the IP3 receptor (Trebak et al. 2003a). A recent mutagenesis study then revealed that the CIRB domain of TRPC3 is involved in channel targeting to the cell membrane without requiring functional interaction with either calmodulin or IP3 receptors (Wedel et al. 2003). To conclude, these latter data strongly support the view of a receptor-operated TRPC3 gating mechanism which is mediated by the second messenger DAG without involvement of protein kinase C (PKC) activity (Hofmann et al. 1999; Trebak et al. 2003a). Very recently however, a longer variant of TRPC3 (TRPC3a) shows Gd3+ resistant (5 μM) activation by store depletion when stably expressed in HEK293 cells and analyzed by single cell fluorometry (Yildirim et al. 2005). Interestingly, PKC-dependent inhibition of TRPC3 activity was recently identified, thus providing a potential feedback loop initiated by DAG-activated PKC (Venkatachalam et al. 2003). At the molecular level, a single highly conserved serine residue immediately downstream of the TRP domain in the C-termini of all members of the TRPC family, appears to be essential for PKC-mediated negative regulation of TRPC3 (Trebak et al. 2005). Another receptor-dependent signaling event that modulates TRPC3 activity was recently discovered. Inhibition of tyrosine kinases in HEK293 cells stably expressing TRPC3 abolished activation of the ion channel by muscarinic receptor stimulation and by DAG. Receptor and DAG-dependent activation was lost following expression of a dominant negative mutant of Src or expression of TRPC3 in a Src-deficient cell line (Vazquez et al. 2004) placing further emphasis on the role of tyrosine phosphorylation for TRPC3 function. A structural analysis of heterologously expressed TRPC3 by glycosylation scanning mutagenesis revealed a naturally occurring glycosylation site in the second extracellular loop of the cation channel (Vannier et al. 1998). Although its functional significance remains poorly understood, the introduction of a second glycosylation site in the second extracellular loop in order to imitate the situation in TRPC6 reduced the high TRPC3 basal activity (Dietrich et al. 2003b). TRPC3 is the most abundant TRPC channel in brain. The expression pattern is most pronounced in cerebellar Purkinje and in olfactory mitral cells (Otsuka et al. 1998). In neurons, TRPC3 appears to be an integral component of a signal transduction cascade initiated by brain-derived growth factor (BDNF), involving PLCγ , generation of IP3 and an increase in [Ca2+]i (Li et al. 1999). In line with this assumption, TRPC3 protein was immunoprecipitated together with the receptor tyrosine kinase TrkB which is activated by BDNF. During brain development, the spatial and temporal expression patterns of both TrkB and TRPC3 were found to coincide and TRPC3 may contribute to the BDNF-induced signaling cascade in pontine neurons (Li et al. 1999). However, the channel characterized in pontine neurons differs from heterologously expressed TRPC3 with regard to its single channel conductance, mean open time and sensitivity to IP3. Until now, it is unclear whether other channel subunits or accessory proteins are needed to reconstitute the distinct biophysical properties observed in pontine neurons. Among the proteins known to interact with TRPC3 in neurons is the soluble N-ethylmaleimide-sensitive factor attachment protein receptor (SNARE) complex and a vesicle-associated protein 2 (VAMP2)-dependent exocytosis of TRPC3 in these cells was suggested very recently in neuronal and epithelial cells and (Singh et al. 2004). In most smooth muscle tissues, coexpression of TRPC3 and TRPC6 or TRPC7 can be readily observed (reviewed in Beech et al. 2004) probably resulting in heteromeric channels of yet unknown composition, functional properties and biological roles (see also Groschner and Rosker 2005). As mentioned before, only the identification of TRPC3 activity in its physiological settings or the phenotypic analysis of TRPC3-deficient mice might shed further light on these important issues. The full-length cDNA of mouse TRPC6 was isolated from brain (Boulay et al. 1997), while human TRPC6 was cloned from placenta (Hofmann et al. 1999). TRPC6 is most prominently expressed in lung tissues as deduced from Northern Blot analysis (Boulay et al. 1997). Three splice variants with shorter amino termini were additionally cloned from rat lung (Zhang and Saffen 2001). Although TRPC6 expression in brain is lower than that of TRPC3, a TRPC6 splice variant, TRPC6A, is highly expressed in the dentate gyrus of the hippocampus (Bonaventure et al. 2002). By in situ hybridization and histochemistry, TRPC6 expression was found to be exclusively localized in the dentate granule cell layer of the adult mouse brain (Otsuka et al. 1998). Single-cell Ca2+ imaging experiments measuring carbachol- and thapsigargin-induced Ca2+ entry, allowed the characterization of TRPC6 as a receptor-regulated, but not store-regulated cation channel (Boulay et al. 1997). The biophysical properties identified by electrophysiological recordings in CHO-K1 cells transiently expressing TRPC6 are summarized in Table 1; a typical I–V relationship illustrating double rectification is shown in Fig. 2. Addition of IP3 activated recombinant TRPC6 channels neither in the whole-cell mode nor in excised inside-out patches, although the G protein activator AlF4− stimulated and the PLC inhibitor U73122 blocked agonist-induced activation of TRPC6, thus pointing to a G protein- and PLC-dependent activation mechanism. Along these lines of reasoning, 1-oleoyl-1-acetyl-sn-glycerol (OAG), a membrane-permeable analogue of diacylglycerol (DAG), as well as the DAG lipase inhibitor RHC80267 markedly increased TRPC6 activity (Hofmann et al. 1999). TRPC6 was the first ion channel identified that is activated by DAG in a membrane-delimited fashion, independently of protein kinases C. The exact location of a putative binding site for diacylglycerols in the TRPC6 protein is still elusive because an OAG-insensitive splice variant of TRPC6, (TRPC6B; Zhang and Saffen 2001) characterized by means of fluorometry turned out to be activated by DAG when analyzed by electrophysiological methods (Jung et al. 2003). More recently, TRPC6 has also been reported to be sensitive to the arachidonic acid metabolite 20-hydroxyeicosatetraenoic acid (Basora et al. 2003). In contrast to the scenario with TRPC6 which is a tightly receptor-regulated store-independent cation channel, TRPC3 and TRPC7 display considerable basal activity (see Fig. 2, Hofmann et al. 1999; Okada et al. 1999). To identify potential molecular correlates accounting for the functional difference, the glycosylation pattern of TRPC6 was compared with that of TRPC3 (Dietrich et al. 2003b). TRPC6 carries two extracellular N-linked glycosylation sites, while TRPC3 is a monoglycosylated protein (Vannier et al. 1998). Elimination of the extra glycosylation site missing in TRPC3 was sufficient to transform the tightly receptor-regulated TRPC6 into a constitutively active, TRPC3-like ion channel. Conversely, engineering of an additional glycosylation site in TRPC3 to imitate the situation in TRPC6, markedly reduced TRPC3 basal activity. Thus, the glycosylation pattern is a critical determinant for the tight regulation of TRPC6 by PLC-coupling receptors (Dietrich et al. 2003b). The regulation of TRPC6 by calmodulin was carefully analyzed leading to an overall picture different from that of TRPC3. Calmodulin inhibitors like calmidazolium and trifluoperazine had an inhibitory effect on receptor-operated calcium influx into TRPC6-expressing HEK293 cells, indicating a stimulatory impact of Ca2+/calmodulin on TRPC6 channel activity (Boulay 2002). The latter concept was further extended by the observation that TRPC6 activation and its acceleration by the extracellular calcium concentration ([Ca2+]o) most probably involves phosphorylation by calmodulin-dependent kinase II, an effect that was not noted for the closely related TRPC7 protein (Shi et al. 2004). To conclude, TRPC6 and 7 are subject to a complex regulation by Ca2+ on both sides of the plasma membrane involving calmodulin-dependent and calmodulin-independent mechanisms (Shi et al. 2004). Like TRPC3, the TRPC6 ion channel is regulated by protein phosphorylation. While PKC appears to contribute to channel inactivation (Trebak et al. 2003b) Fyn, a member of the Src family of protein tyrosine kinases, increases TRPC6 channel activity. Stimulation of EGF receptor entails tyrosine phosphorylation of TRPC6, and Fyn and TRPC6 physically interact in mammalian brain as well as after heterologous expression in COS-7 cells (Hisatsune et al. 2004). The physiological role of TRPC6 is still largely unknown. However, there is mounting evidence that TRPC6 is an intrinsic constituent of receptor-operated cation entry involved in numerous physiological processes. In human platelets thrombin-activated cation influx is independent of store depletion, consistent with the observation that TRPC6 is highly expressed in these cells. In this model system, TRPC6 does not serve as a substrate of tyrosine kinases, but was phosphorylated in a cAMP-dependent manner (Hassock et al. 2002). It is well documented that phosphoinositide 3-kinase (PI3K) activation resulting in the production of phosphatidylinositol 3,4,5-trisphosphate (PIP3) triggers platelet aggregation by inducing a Ca2+ influx (Lu et al. 1998). In accord with this concept, TRPC6 was recently identified as the putative molecular correlate of a PIP3-sensitive calcium entry system in platelets, Jurkat T cells and RBL-2H3 mast cells (Tseng et al. 2004). There are numerous studies providing evidence for an important role of TRPC6 in vascular and pulmonary smooth muscle cells. By comparative biophysical characterization and gene suppression using antisense oligonucleotides, TRPC6 was suggested to be the molecular correlate of the α1-adrenoceptor-activated non-selective cation channel in vascular smooth muscle cells (Inoue et al. 2001) and the vasopressin-activated cation channel in an aortic smooth muscle cell line (Jung et al. 2002). In addition, TRPC6 has been proposed to play a critical role in the intravascular pressure-induced depolarization and constriction of small arteries and arterioles (Welsh et al. 2002) known as the Bayliss effect. Myogenic constriction of resistance arteries results from Ca2+ influx through voltage-gated Ca2+ channels subsequent to membrane depolarization. Apart from TRPC6, the Ca2+-activated cation channel TRPM4 has recently been implicated in myogenic vasoconstriction (Earley et al. 2004). The precise location of either TRPC6 or TRPM4 in the signaling pathway elicited by elevated intravascular pressure still remains poorly understood. Recently, expression studies revealed that PDGF-mediated proliferation of pulmonary artery smooth muscle cells (PASMC) is associated with c-jun/STAT3-induced upregulation of TRPC6 expression (Yu et al. 2003). In this context it is intriguing to note that excessive PASMC proliferation, a major cause of the elevated pulmonary vascular resistance in patients with idiopathic pulmonary arterial hypertension (IPAH), also correlates with overexpression of TRPC6 and TRPC3 proteins in these tissues. In line with these data, downregulation of TRPC6 by TRPC6 specific small interfering RNAs resulted in attenuated IPA-PASMC proliferation (Yu et al. 2004). Moreover, TRPC6 expression is upregulated in pulmonary arteries of rats kept under chronic hypoxic conditions to induce pulmonary hypertension. As expected, OAG-induced cation entry was significant increased in hypoxia-treated PASMC as compared to control cells (Lin et al. 2004). Recently, we were able to present initial results on the phenotype of mice deficient in TRPC6. Based on the above reviewed data, we predicted that loss of TRPC6 function would lead to diminished vascular smooth muscle tone and hypotension. Unexpectedly, we observed higher agonist-induced contractility in aortic rings prepared from these mice, and elevated systemic blood pressure that was further increased by inhibition of nitric oxide (NO) synthase (Dietrich et al. 2003a). These effects could be explained by in vivo replacement of TRPC6 by TRPC3-type channels which are closely related, but constitutively active resulting in enhanced basal and agonist-induced cation entry into smooth muscle cells leading to increased smooth muscle contractility (Dietrich et al. 2004, Mederos y Schnitzler et al. 2004). Because the expression pattern of TRPC3 and TRPC6 overlaps in most, and that of TRPC6 and TRPC7 in some smooth muscle cell tissues (reviewed in Beech et al. 2004), a heterotetrameric TRPC3/6 or TRPC6/7 channel complex might be the real molecular correlate of the nonselective cation influx into smooth muscle cells (see Fig. 3, reviewed in Gudermann et al. 2004). Our findings imply that TRPC3, 6 and 7 are functionally non-redundant and that TRPC6 plays a unique role in the control of airway and vascular smooth muscle contractility. Putative role of TRPC3/6/7 heteromultimeric channel complexes in smooth muscle cells. Following activation of muscarinic acetylcholine receptor (R) or α1 adrenoceptors (R) by agonists (A), G proteins of the Gq class (Gq) activate phospholipases C-β (PLCβ), which hydrolyzes phosphatidyinositol 4,5-bisphosphate (PIP2) into diacylglycerol (DAG). Activation of hypothetical heteromeric TRPC3/6/7 channels by DAG results in a nonselective cation influx in smooth muscle cells. The receptor-operated calcium influx (ROC) will contribute to membrane depolarization and activation of voltage-gated calcium channels (VGCC), which mediate the bulk of the Ca2+ influx and smooth muscle contraction (reviewed in Gudermann et al. 2004). TRPC7 was first cloned from mouse brain and its function was analyzed after heterologous expression in HEK293 cells (Okada et al. 1999). TRPC7 was characterized as a non-selective cation channel activated by DAG secondary to receptor stimulation, but clearly unaffected by store depletion. Its biophysical properties are summarized in Table 1. In contrast to these initial findings, cloning of human TRPC7 and stable expression of the protein in HEK293 cells resulted in store-operated channel activity (Riccio et al. 2002). To shed further light on this discrepancy, both clones were recently reanalyzed in HEK-293 cells and compared to TRPC3 and TRPC6. While stable expression of both TRPC7 clones in HEK293 cells resulted in a receptor- and store-operated mode of activation, transient expression in the same cells revealed only receptor-operated activation of TRPC7 (Lievremont et al. 2004). Both clones shared the high basal activity of TRPC3. Suppression of carbachol-activated TRPC7 channel activity by nanomolar [Ca2+]i via CaM and enhancement of channel activity by IP3 was demonstrated recently (Shi et al. 2004). TRPC7 is expressed in heart, lung and eye, with lower levels of transcripts in brain, spleen and testis (Okada et al. 1999), but it is not expressed endogenously in HEK293 cells (Riccio et al. 2002). There are no data available about its physiological functions and a gene-deficient mouse model is still not available. The functional characteristics of TRPC homomers overexpressed in different cell lines may not truly represent their physiological properties in vivo. One reason for the latter notion is the formation of heteromeric channel complexes in native tissues. The basic principles of homo- and hetermultimerization of heterologously expressed TRPC channel monomers were defined by four different approaches: cellular cotrafficking of TRPC subunits, differential functional suppression by dominant-negative subunits, fluorescence resonance energy transfer (FRET) and coimmmunoprecipitation (Hofmann et al. 2002). All experimental approaches employed led to the conclusion that TRPCs assemble into homo- and heterotetramers within the confines of TRPC subfamilies. Only TRPC1 has the ability to form channel subunits with the TRPC4/5 subfamily, while TRPC2 is not able to interact with any other TRPC channel (see Fig. 1). These results were confirmed by systematic coimmunoprecipitation of TRPCs from isolated rat brain synaptosomes (Goel et al. 2002). Recently, novel combinations of TRPC1—TRPC4/5 together with TRPC3/6 were identified in HEK293 cells as well as in embryonic brain but not in adult rat tissues (Strübing et al. 2003 and see Fig. 1). Moreover, native TRPC3/6 heteromers were identified in epithelial cells (Bandyopadhyay et al. 2005) and TRPC2 appears to interact with TRPC6 in murine erythroblasts (Chu et al. 2004). These discrepant findings may be reconciled by the presence of embryonic cell-specific factors stabilizing such complexes. In general, TRPC channel complexes might be organized in supramolecular signalling complexes in native tissues. Such a complex called signalplex was already identified in photoreceptors of Drosophila melanogaster (Montell 2005), and there is evidence for TRPC1 function in complexes with the adaptor protein homer (Yuan et al. 2003). Furthermore, TRPC1 and TRPC3 are assembled in caveolar lipid rafts in multimolecular signaling complexes containing PLCβ, Gαq/11, IP3R, SERCA, ezrin and caveolin 1 (Lockwich et al. 2000, 2001). Along these lines, co-localization and functional interaction of TRPC3 and the Na+/Ca2+ exchanger 1 (NCX1) was discovered recently (Rosker et al. 2004; Groschner and Rosker 2005). The heteromerization potential of the TRPC3/6/7 channels may also explain the complex regulation of these channels by [Ca2+]o. TRPC6-like currents in A7r5 cells were inhibited by millimolar [Ca2+]o but stimulated by a reduction to 200 μM [Ca2+]o (Jung et al. 2002). A potentiating effect of decreasing [Ca2+]o has also been described for TRPC3 coassembled with TRPC1 (Lintschinger et al. 2000) and for TRPC7 (Okada et al. 1999). At present, the reason why nature provides us with several DAG-sensitive TRPC channels is still enigmatic. Future experiments will have to work out whether these proteins are functionally redundant or whether they serve unique and indispensable roles in certain physiological processes. Hopefully, the overt lack of specific pharmacological blockers will be at least partially overcome by the use of small interfering RNAs. As already alluded to in this article, DAG-sensitive TRPC proteins may play a central role in the control of vascular smooth muscle tone, because they are likely molecular correlates of receptor-operated cation entry. DAG-sensitive TRPCs may therefore be attractive novel drug targets for tackling pathophysiological states such as hypertension (Schilling 2001; Yu et al. 2004) and pulmonary diseases (Li et al. 2003, 2005).